A recovery session for the squad on Thursday at the Ciutat Esportiva following on from the trip to South Africa for the friendly against Mamelodi Sundowns which ended in a 3-1 win for the blaugranes. The training session saw the 23 players who made the trip to Johannesburg take part, first team players and those from the B team, Aleñá, Ruiz de Galaretta and Cuenca. Goals from Dembélé, Luis Suárez and Andés Gomes on Wednesday gave the blaugranes the victory in the FNB Stadium in front of 87,000 fans. 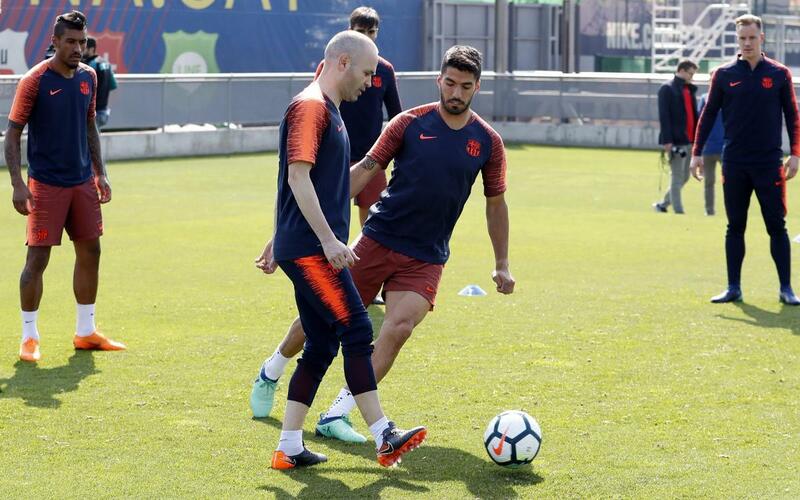 The final game of the season comes on Sunday at Camp Nou when they face Real Sociedad in LaLiga, a game which will also serve to pay tribute to Andrés Iniesta also. Thursday's session was the final one this season at FC Barcelona for midfielder Paulinho. The Brazilian international is set to join up with the national team on 21 May ahead of this summer's World Cup in Russia and given he has played almost 18 months non-stop in China and then with Barça, coach Ernesto Valverde thought it only fair to give the player permission to miss Sunday's game with Real Sociedad at Camp Nou.